Michael Larsen, chairman and associate professor of biology for Campbell’s College of Arts & Sciences, was honored with the North Carolina Science Teachers Association’s Distinguished University Teacher Award, the organization announced this month. The award is presented annually to educators for excellence and contributions to science education across North Carolina. Larsen received the honor at the 49th N.C. Science Teacher Association Awards Ceremony recently in Charlotte. Larsen’s research interests lie in the area of freshwater and estuarine algal blooms, zooplankton community ecology, the effects of agricultural runoff and turbidity on aquatic ecosystems, and other water quality management issues. He teaches a variety of environmental science courses at Campbell, including Introduction to Environmental Science I & II, Environmental Toxicology and Aquatic Ecology. He is the coordinator of the Environmental Sciences minor and co-advisor of the Walker Biology Club. 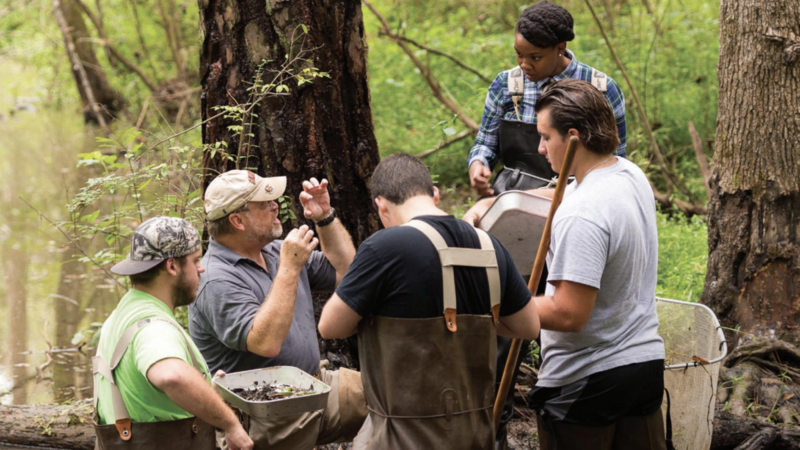 He began his professional career as a researcher in the Center for Applied Aquatic Ecology at N.C. State University, and his desire to teach quickly led Larsen into science education. A member of the Campbell faculty for 23 years, he currently serves as the Department of Biological and Environmental Sciences chair. He’s known for his cutting-edge environmental research, which focuses on the health and quality of freshwater communities and the impact of toxic contaminants on North Carolina water ways. As a respected environmentalist, Larsen’s collaborations with private landowners and North Carolina’s agricultural, wildlife and fishing agencies, have produced numerous conservation and resource management policies. A frequent guest speaker for civic groups, Larsen’s presentations and actions encourage others to become citizen scientists working to preserve and protect our environment. Instead of just talking about issues he models stewardship. At Campbell, he noticed a limited awareness of recycling. He, therefore, loaded his car with recyclables collected from the campus and drove a substantial distance to leave the materials at a disposal facility. He also incorporated activities in his Environmental Science classes in which students collected litter that they separated into recyclables and non-recyclables thus creating students’ investment in protecting the environment. Under Larsen’s mentorship, student involvement grew and established recycling bins throughout the campus. Within months, by engaging his students, he extended his concept of stewardship to become a strongly embraced county-wide recycling program. Larsen is a three-time honoree as Campbell’s Professor of the Year. Serving as the liaison between his department and education, he has assisted with accreditation procedures and development of teacher preparation programs. He has also led numerous education majors on field and study abroad trips. He serves many schools and is the ever-present volunteer for regional science fairs and Science Olympiad competitions. In addition to teaching, Larsen is a decorated retired Army colonel, having completed several tours to the Middle East.